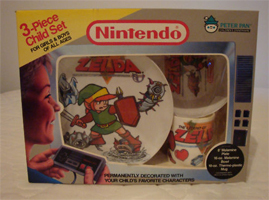 Check out this great Zelda Dinnerware Set! The set contains only 3 pieces, and is sold as a children’s item, “FOR GIRLS & BOYS OF ALL AGES.” Since this the the only item not yet in Mases’ collection, it’s no wonder the bidding will start at $15,000! And even more crazy: the seller seems to think the package is worth $100,000! 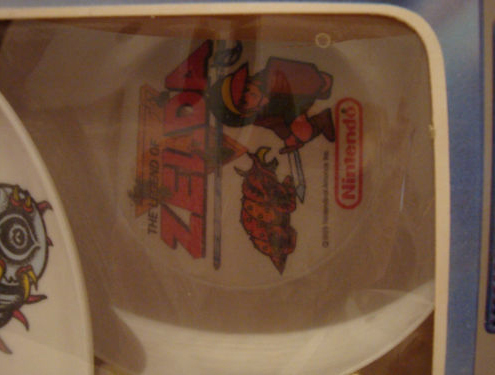 The price is steep, but the seller describes it as, “Extremely Rare,” “Brand New Still in the Packaging!” “completely intact with no tears!” and the full listing has a lot more exclamatory phrases. He also claims he’s been unable to find another set in the same condition. Click ‘read more’ for close ups of the dishes and an update on our YouTube channel from Mases. UPDATE: New low price! The seller, since putting the set up for auction, has lowered the opening bid to $1,000 and is now expecting $10,000 for the set. 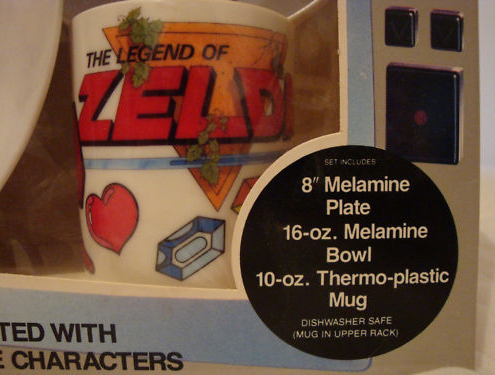 Well, the set is definitely rare, but is this item really collectible? And does anyone even want it? I guess we’ll find out as bidding proceeds. The set was made by Peter Pan, and was licensed by Nintendo in the same era of the Legend of Zelda Cartoon. Fortunately though, this set features art similar to the original Legend of Zelda, and not the cartoon. The package is pretty neat, and showcases several classic Zelda items and enemies. The woman playing Nintendo is a nice touch as well. What do you all think of this item? Worth collecting? Do you think it will reach the seller’s goal of $100,000? Let us know in the comments. Click the images to view them at full resolution. In not unrelated news, Mases recently posted a video on our YouTube channel about the videos he will be posting which will show off his rather extensive Zelda collection. 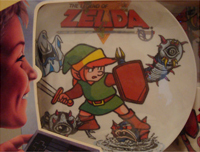 He also discusses upcoming video walkthroughs and affiliation with Zelda Dungeon’s YouTube account.